A 1942 Hudson Commodore 8 has been chosen this week’s featured DEAL of the DAY. When the Cars-On-Line.com newsletter came out today we found which classic car would be selected as the internet’s top deal. The vintage Hudson classic will be highlighted on the front page of the Cars-On-Line website on Sunday. We have a “cult” group of collectors who cherish classic Hudson vehicles. Everytime one gets listed they swarm. 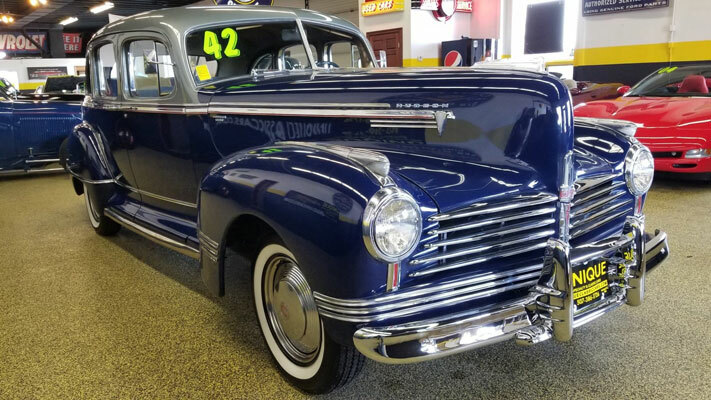 So we hope you get a shot at this 1942 Hudson Commodore 8 while it is still on the market. 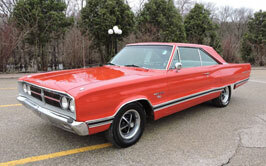 Unique Specialty & Classics out of Mankato, Minnesota just listed it for sale at a very nice price point. (Click here to review dozens of detailed photos of this remarkable classics.) We are told it is a great running and driving vehicle so it should peak a lot of interest. They say it was originally from South Dakota where they do not have rust issues because they don’t use salt on the roads. The Blue and Silver metallic paint shines really nice along with a clean interior. The 4-wheel hydraulic brakes are a huge upgrade because this is a big car. It still has its factory heater and defroster, correct wheels and beauty rings, and the odometer reads 47,010 miles. The asking price is $13,900. The DEAL of the DAY preview gives you first shot at all the cars that will be highlighted in the DEAL of the DAY feature on the Cars On Line home page. Often these cars sell in the newsletter before they even make it to the home page! You’ll always see them here first, though. Follow this link for a preview of all of the coming week’s DEALs of the DAY as featured in the COL newsletter.